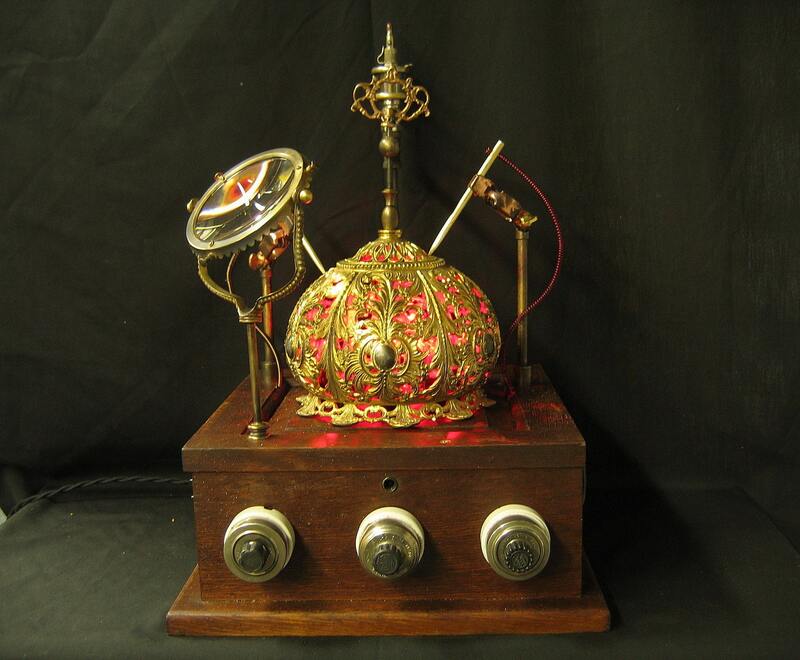 This is my Steampunk lamp Diabolical Box #84. I call it "The Golden Dome"
This is one of my most involved boxes. There are three light groups each controlled by one of the switches on the front. Inside the dome are eight small bulbs 4 red 4 clear. In the center is a flicker bulb. All bulbs are included. Please be sure to click the link below it will take you to my Steampunk blog and a brief fiction about this box. Vintage and re-purposed parts include: Antique oak telephone box, porcelain switches, drip oiler, oil lamp font, gas light finial, and distortion lens. All my Diabolical Boxes come with a dimmer so you can turn the lights down to an eerie glow. All light bulbs are included with extras. The light bulbs I use are easily available on the internet. I supply a list of web site sources for all the bulbs I use.